Chief Justice of India T S Thakur today assured Nobel Peace Laureate and Bachpan Bachao Andolan founder Kailash Satyarthi that despite the shortage of judges and other challenges faced, judiciary will continue to be committed, concerned and conscious towards children’s cause. “We should deliberate whether the problem in tackling the issue of missing and trafficked children, is a lack of commitment or lack of enforcement? There's no dearth of provision of child rights in international policies and in the Indian constitution but the enforcement of laws is not translating into the ground reality. Every year in India 60,000 children go missing and most of them are not traced. Delhi and Maharashtra are two states from where the highest number of children goes missing,” the CJI said inaugurating the National Workshop on Rehabilitation of Trafficked and Missing Children’ at the imposing Vigyan Bhawan in which Supreme Court and High Court judges were present. The Chief Justice reflected on the extent of the problem of missing and trafficked children and expressed the need for higher sensitivity among the enforcement agencies. 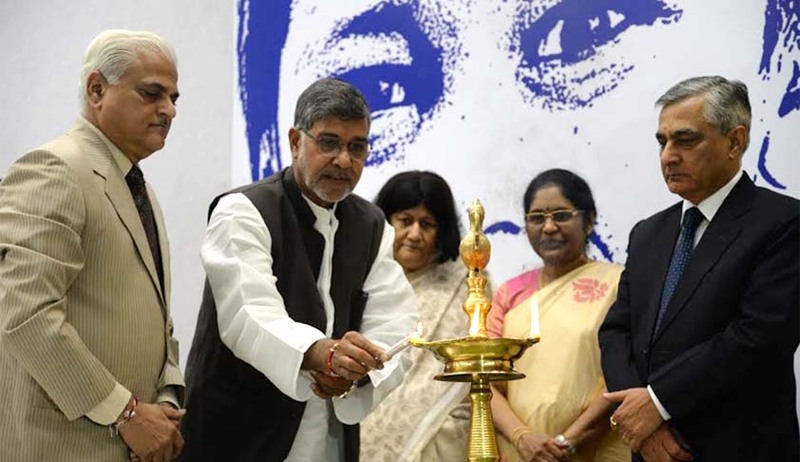 Speaking at the event Satyarthi said, “We express our gratitude to Hon’ble CJI to take up and support the crucial matter of providing speedy justice and rehabilitation of trafficked and missing children. This consultation is crucial towards creating a robust child protection response mechanism for the prevention of trafficking of children, their effective rehabilitation and the related issues. Existing efforts in this regard including repatriation and follow up remain sporadic due to lack of effective intra and inter-state agency coordination and collaboration”. Justice Thakur reiterated Satyarthi’s view to use technology in tracing missing children and called for a people’s movement to tackle this problem. Highlighting the seriousness of the issue, Satyarthi appealed to the Chief Justice of India to ensure that there should be special courts to deal with the cases of children with the required sensitivity in a time bound manner. The two-day Workshop was organised by the All India Legal Aid Cell on Child Rights together with National Legal Services Authority (NALSA), Delhi State Legal Services Authority and Bachpan Bachao Andolan, is an initiative to establish appropriate mechanisms for the rehabilitation and repatriation of children and to ensure the mainstreaming of child survivors into a safe and productive life. The technical sessions of the workshop will happen on 23rd August at the Constitution Club, Rafi Marg, New Delhi. Identifying the current gaps and challenges in inter-agency and interstate coordination for the facilitation of rehabilitation and repatriation of missing and trafficked children. Ascertaining the specific roles and responsibilities of stakeholders in facilitating a coordinated and convergent approach to rehabilitation and repatriation, and to fix accountability. Satyarthi shared that Bachpan Bachao Andolan’s extensive database covering over 15000 children rescued in past 6 years could play a very vital role in creation of holistic care plans for proper rehabilitation of children. He also supported CJI’s proclamation on the need of appointment of more judges citing that it would facilitate the effective working of the designated special courts for the cases of offences against children.